For the editors of "Home" is introduced restrictions on the number of documents held (no more than 30) in a single day. Those users who are not going to move to the commercial version of TCU, and that have a large document - do not update your version to the current TCU. A new type of retail outlet (structural unit of the company) - restaurant hall. In the customer card expanded configuration sales agent to interact with the TCU Mobile new generation. The new TCU Mobile based on Google Android is ready, there is release of the documentation. Added ability to display the full name of the product categories in the register of goods and commodities in the tool selection. Switching the view mode is configured, see "Interface". Support for data collection terminals, based on Google Android. Morehere and here. When you copy a document could be distorted by the sum settlements. Fixed that. In the Purchase Invoice update the price list passed only the first column price, regardless of whether the column in the invoice. When working with MS SQL Server database product images are stored directly in the database. Changes associated with the restaurant area. Restrictions on discounts for certain products. Now for the goods you can set a discounts limitations. If the customer discount is set to 3% and the profitability of the product does not allow such a discount, then this product may be limited, such as one percent. Specified in the item card under "Details". 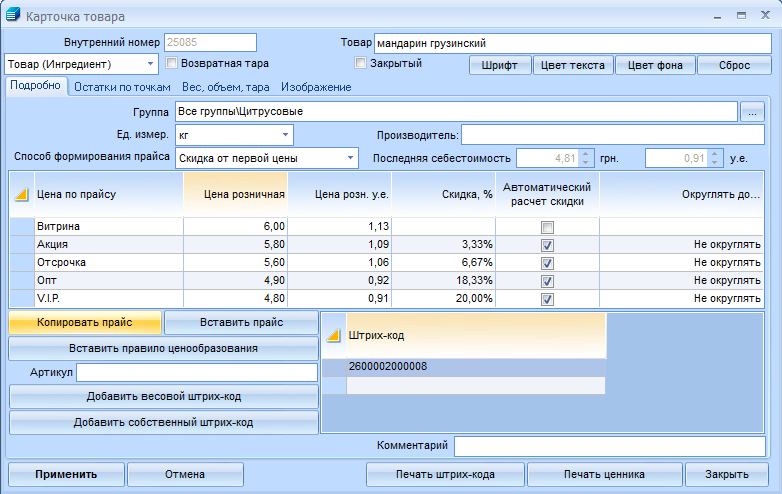 In the Client Card on the "Calculation Data"tab the choice of type and bind to the discount price list column are summarized in a single parameter. In Purchase Invoice Discount now set in the Main Properties Section. In the "Bottom Line"section now shows the calculated discount (with rounding and restrictions on discounts). Changed message when you delete records from article directories, groups, customers and vehicles. Default Unit of Measure Value transfer to the system setup "interface"section. Improved price lists. Now, open the Good Item Card, the price can be copied at the touch of a button. Then in the list of goods and to allocate the items you want to insert the price of each item selected. There is also an option when you want the rule of pricing only, without changing the price, in which case you should use the following shortcut menu item. 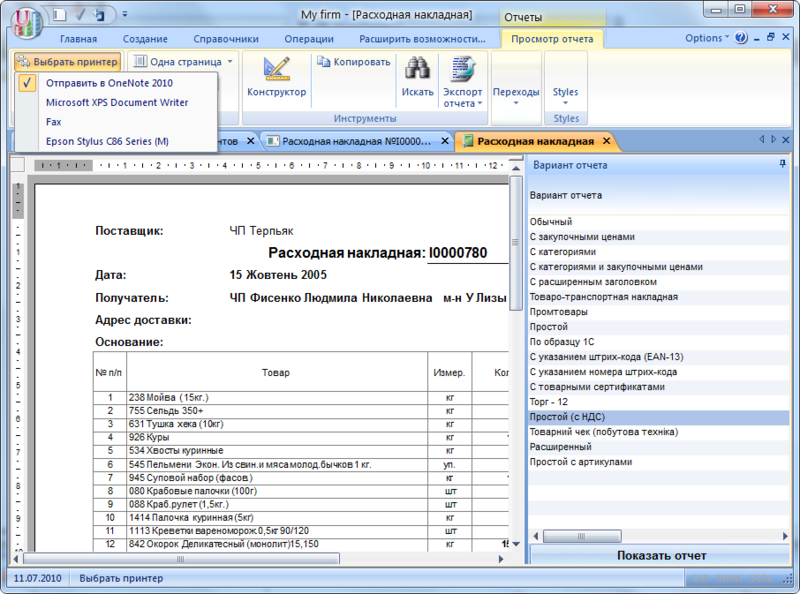 Now you can copy data to the act of production of any type of document. and the right button to insert the rule. Realized built-in query builder. 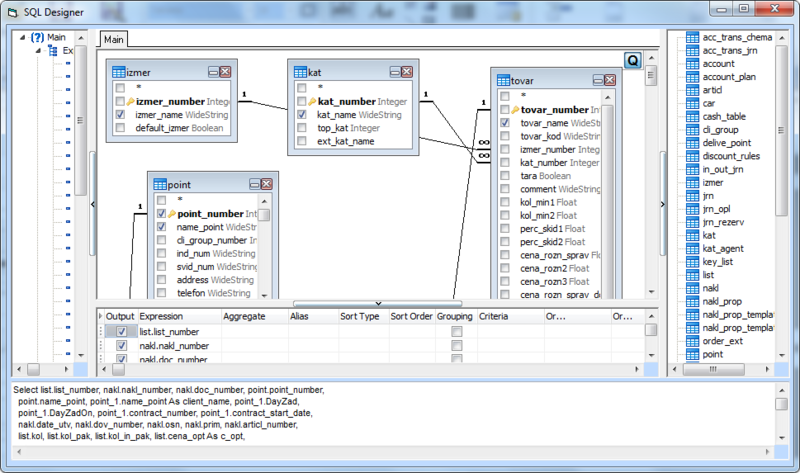 This tool allows you to visually construct SQL queries. SQL queries are the basis for reporting. 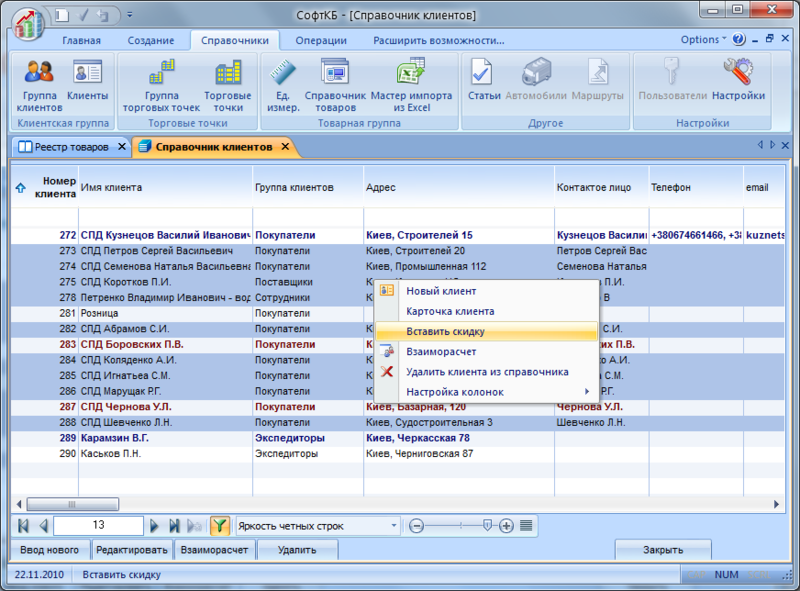 The whole complex of works on creation of a universal and complete report designer so far been completed. This historic event was pretty mundane. 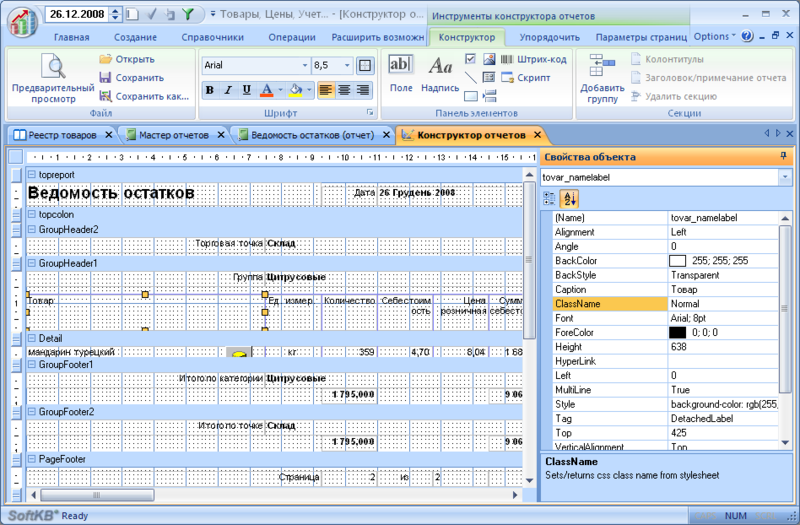 By August 1, 2010 will be prepared a complete set of documentation for Report Designer. The Query Designer is called from the Report Designer. To do this, select a data source and in the Properties window for the Source property click the "..."
Now you can bind the report to a particular printer. Binding a report to the printer and stored automatically when you click on "Quick Print" report will be dispatched to the default printer, and a pre-specified printer. If a report linking the printer is not specified, print will be sent to the default printer (the configured Windows). This feature can be successfully used for printing checks on the tape printer, with printing invoices can be performed conventional laser printer. 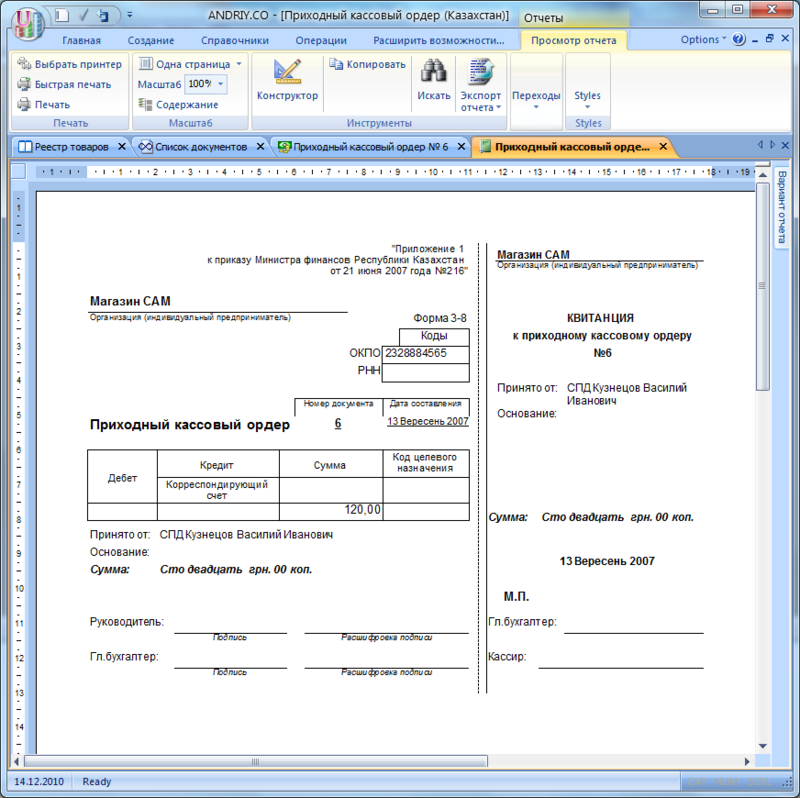 Individual reports can be output to network printers, etc. And, for dessert, savings discounts. Specifies the type of discounts - funded, and write the rules. In the example shown four rules. Discount is available on the optimistic criterion - that is, we choose the rule that meets the conditions and provides maximum discount. Number of rules is not limited. 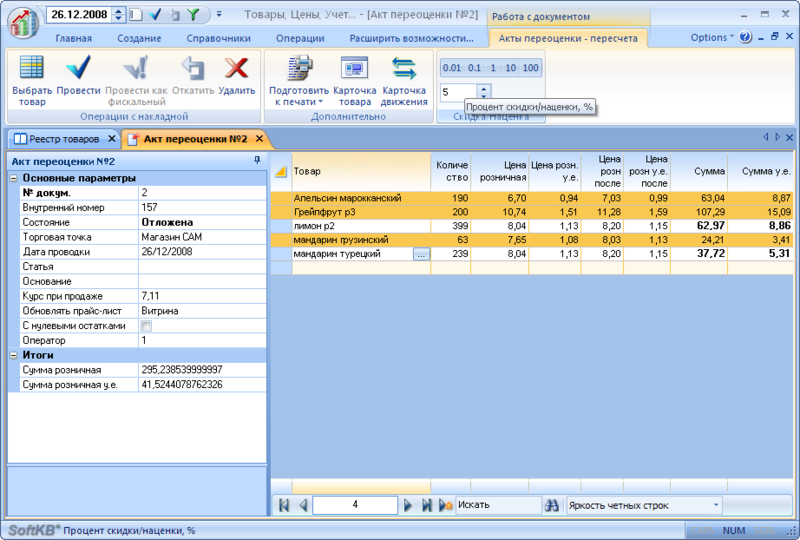 Added report "turnover balance sheet by product groups". 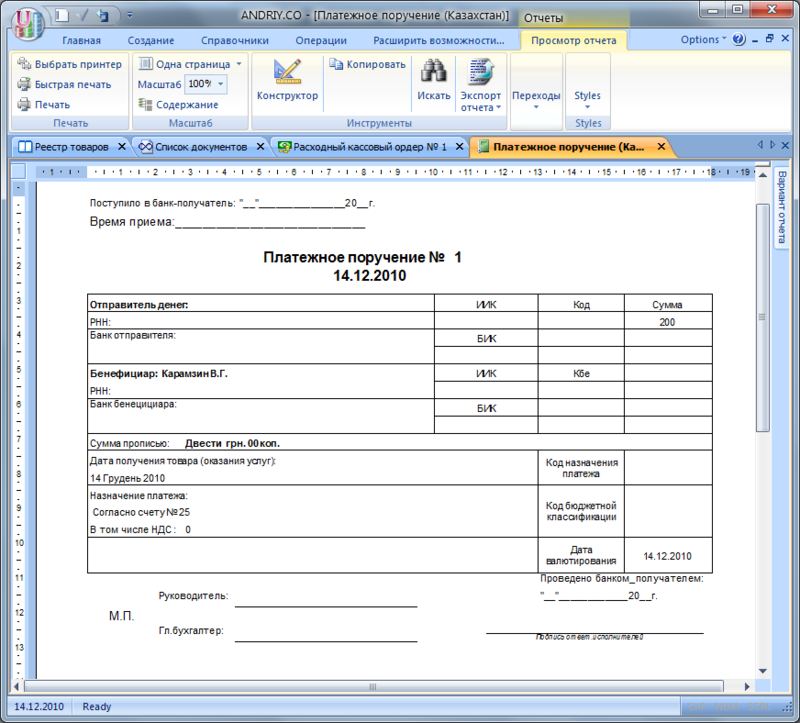 Implemented a new scheme to create documents such as one based on the documents of another type. 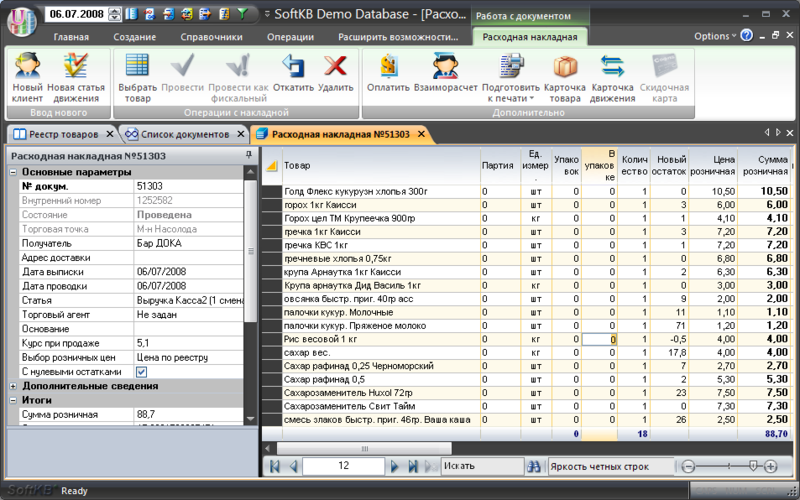 Transfer Wizard database format MS SQL Server. There's no need to send the database to be converted into SoftKB. It suffices to use the materials on the links Article 1 and Article 2, to configure SQL Server and move it to a database. Wizard to move a database accessible on the team SQL Server the Expand opportunities. New versions, notification about the new features the site, new articles and any other news are now available in a popup window in the lower right corner of the screen. Upon request, the service can be disabled in Preset tzu in the Miscellaneous. 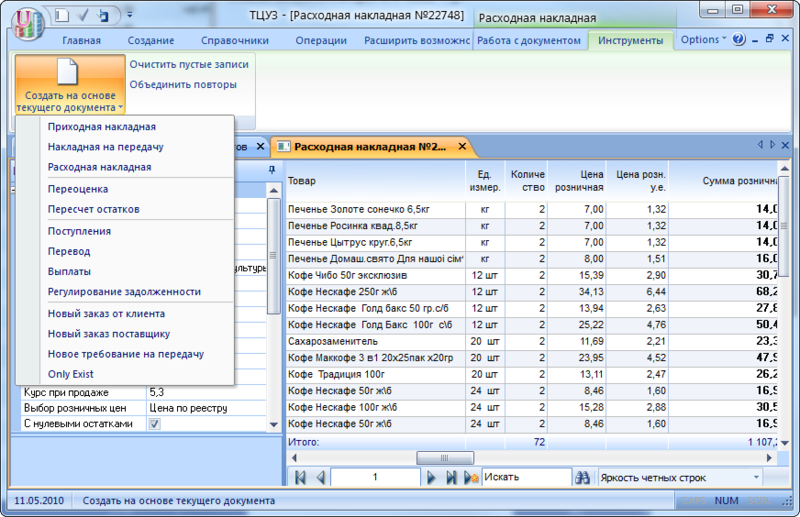 Polzovateskie reports can now draw in different styles of taste. significantly speeded up the work when connecting to the database on the slow lines via the Internet. Completely revised polling mechanism of user rights and status of documents. 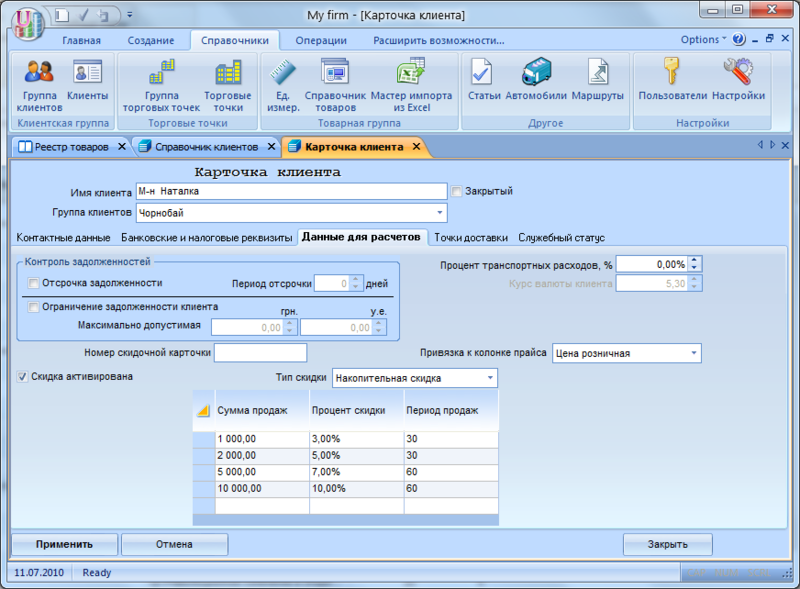 Added a number of reports that facilitate financial planning company. 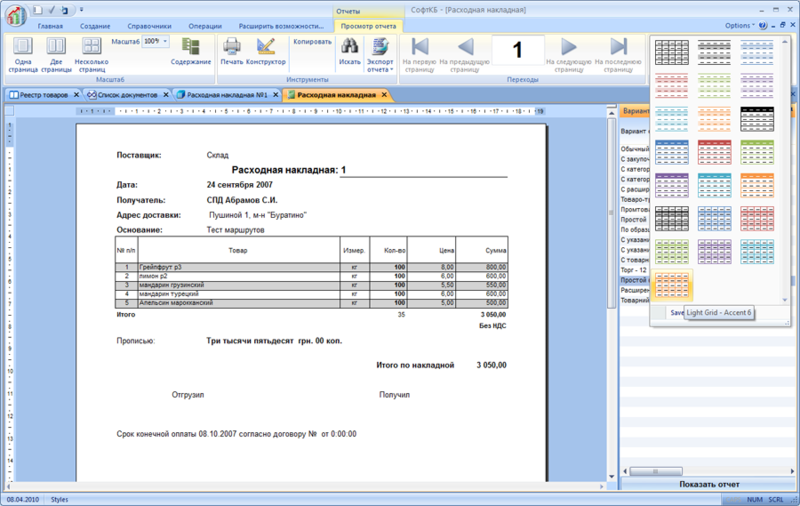 Import Wizard Purchase Invoice. Allows you to import documents from file format Tzu Microsoft Excel. more in the training course. 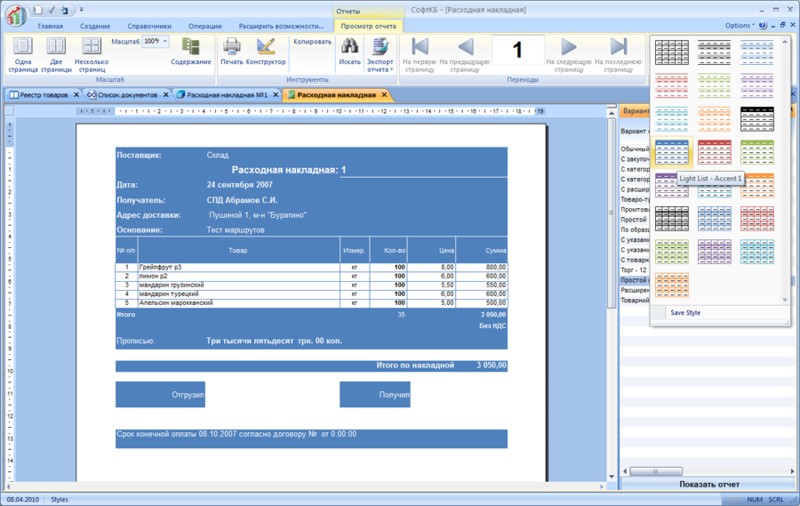 Document Order-demand can also be automatically calculated, as well as an order to the supplier. from the order-form requirement may be overhead for the transfer in two modes: all the goods and only those that are at the point the provider. Added a new version of the report to a credit bill, which is officially called Rozrahunok koriguvannya кількісних that вартісних показників to податкової накладної, better known under the unofficial name Koriguyucha invoice . In order to the supplier now saved not only the quantity ordered, but the calculated program number, balances on the settlement date and amount of sales for the period calculated. If the user does not agree with the calculated amount and fixes it, the field of settlement and the number is highlighted in red. Added ability to copy documents. You can copy documents at one point and paste them into another retail outlet (or the same). Sales Report is now called the report on shippings. Sales Report is also available, now shows only shipped and paid for merchandise that is sold. Fixed bug when importing goods items from Excel. When posting commodity items in the expenditure invoice imported goods carried as a service. For products that are added to the directory in the traditional way, no problem. bug when transferring goods from one point to another. The error occurs only if the settings warehouse model was included grouping the registry entries for the supplier. They displayed this during the retransmissions of the goods at the point of the recipient. Despite the fact that such a record already existed on the point, the system will still generate new registry entry. When setting the default storage model is not affected. 1. Associated packaging Support for related packaging unlimited nesting. For example, for the goods "Beer" related packaging "bottle" for good "bottle" related packaging boxes. Number of attachments is unlimited. 2. Order-demand. Now you can create an order not only to the supplier, but also at any retail outlet systems, such as parent stock. Used, for example, shops, in order to maintain the range and transmission of applications for the head stock. For the production, to order the ingredients and components. 3. SQL Server It works as a trusted connection, Windows, and password authentication database. 4. speed downloads significantly speed up the initial download of the program at work on slow Internet channels. Given the saturation of the product by various features and functions we have decided to extend the probationary period for the commercial editions tzu from 30 days to 60 days. 2. a log. When you click on "Tzu" (large, round, in the upper left corner) can cause a log. This is a very powerful tool that allows you to track all user actions on the workplace. It also recorded the contents of the overhead at the time of posting and rollback. As a result, you can see how the document with the various actions on them. In each record the user's rights are fixed at the time of the transaction. 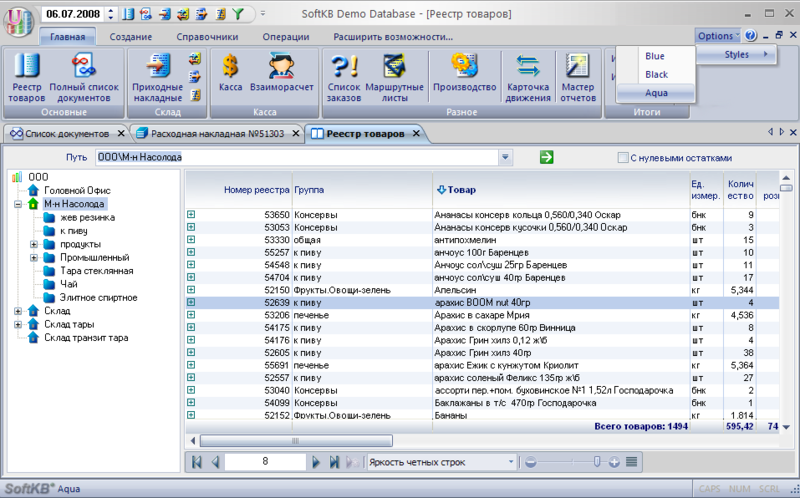 By working with the magazine SoftKB plans to release a detailed article. 3. 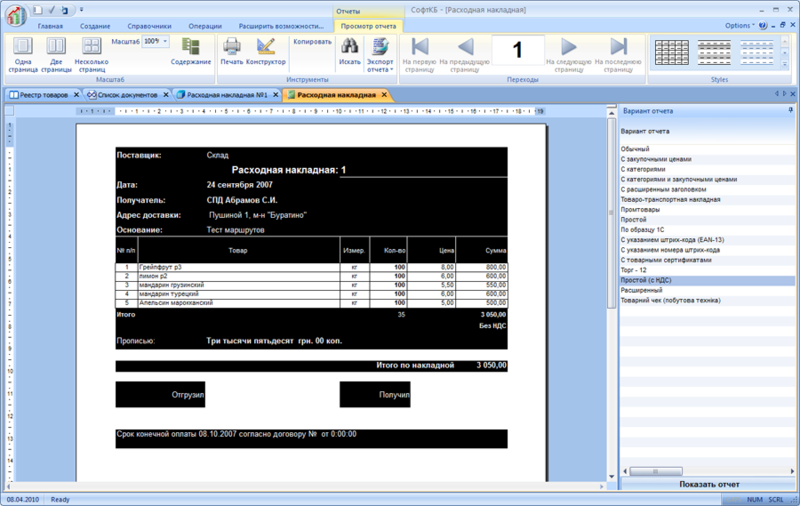 Added report "invoice" for Ukraine in a custom format. 4. Significant additions to production. Act to dissolve ingredients. Ability to print the acts of production, cost card and acts to dissolve the ingredients. 5. And of course new support system licenses. Now, when you change the computer, reinstall the system you can simply withdraw from the action of the old key and put in place a new key. You can do this online our online shop absolutely free! 1. 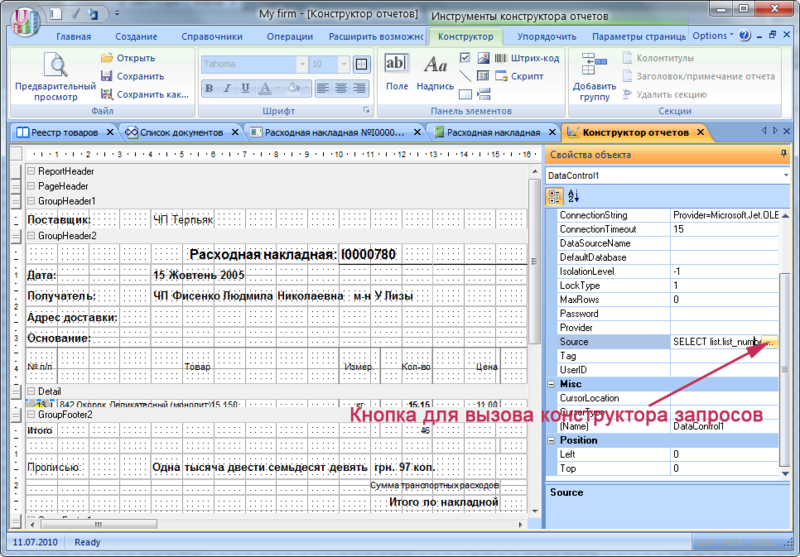 Implemented Import Wizard product names of the file format Microsoft Excel. Described in more detail in the article. 2. 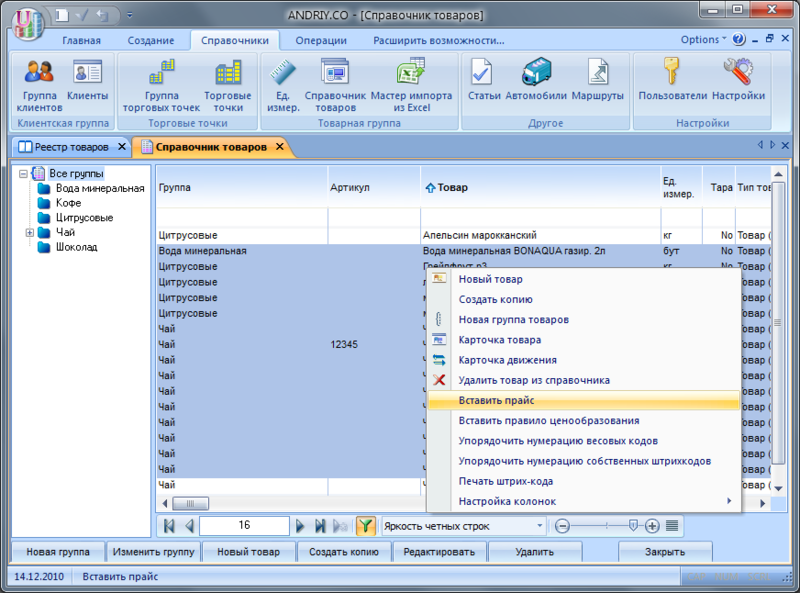 In the overhead in the field of bar code you can now enter and articles of goods. At the same products will be substituted automatically. 3. In the tool of choice of goods in the filter field, you can enter not only part of the name, but part of the sheet. 4. Earlier forms of overhead opened with a second delay. Now - instantly. 5. All interface settings are now stored in the registry Windows - making about 20-30% increase in performance. 6. Pricelist is now possible to print not only directly from overhead, but from the act of revaluation. 1. Automatic creation of purchase orders supplier. 2. The restriction period. News for the editorial staff of Network and Ultra. Administrator can now set the date until which the users can not view the data. Added in order to improve security (staff and external verification). 3. In the act of converting the balance on the bar codes can be added not only the usual products, but also the weight with automatic «Weights after». 4. 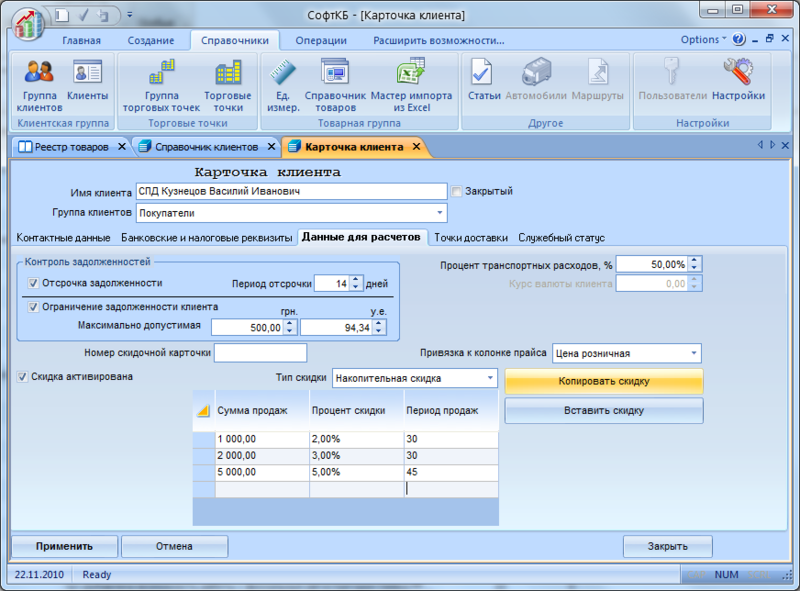 In the automatic creation of orders added to an alternative mode «For the missing number». 5. In cart product adding the parameter term guarantees. News for household appliances, computers and mobile phones. 1. There were strange and very rare bug in SQL Server versions (Network and Ultra), which carried out the consignment note does not retain a sign of approval. Re-entered prostanovku trait adoption, the problem has gone. 2. When printing cash receipts order the amount in words on the penny different from the amount in figures, if the amount ends at 5 cents. Corrected. 3. Fixed a bug that occurred when entering the weight of goods to the bar code from the act of converting residues. Weight is taken the number to convert, was in the number after it. Given the fundamental changes in the reporting system, an update installation will be automatically replaced by the file settings.mdb. Registered users must re-enter their answer keys are provided when you register the program. Users install the software first, or have not been registered, set TTSU3 in normal mode. 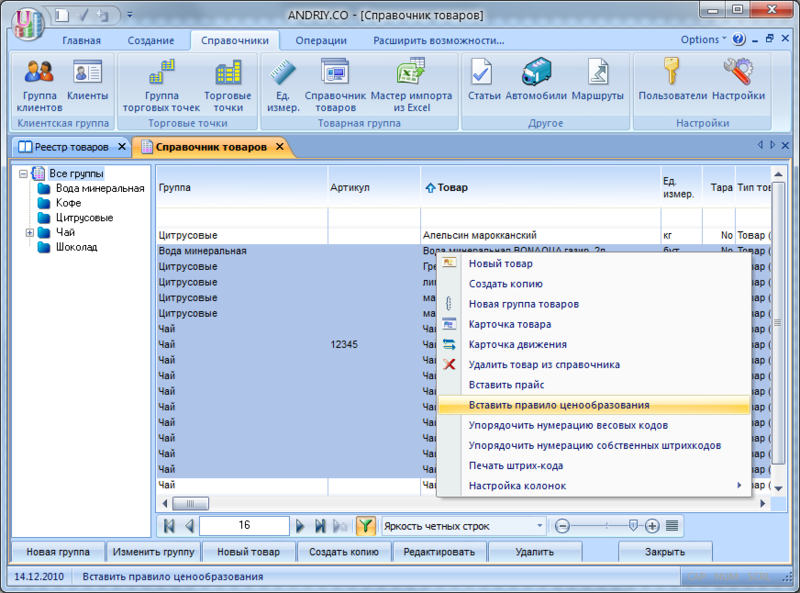 We have tried to implement the constructor in the light of the latest software trends. Conceptually, it is very similar to konctruktor Reports MS Access 2007, and will not cause issues for people who know how to do reports in Access. When the report was prepared for print and displayed for viewing, you can use the designer. To do this the right mouse button (or on the content tab) Click on the "designer." Opens the following form. 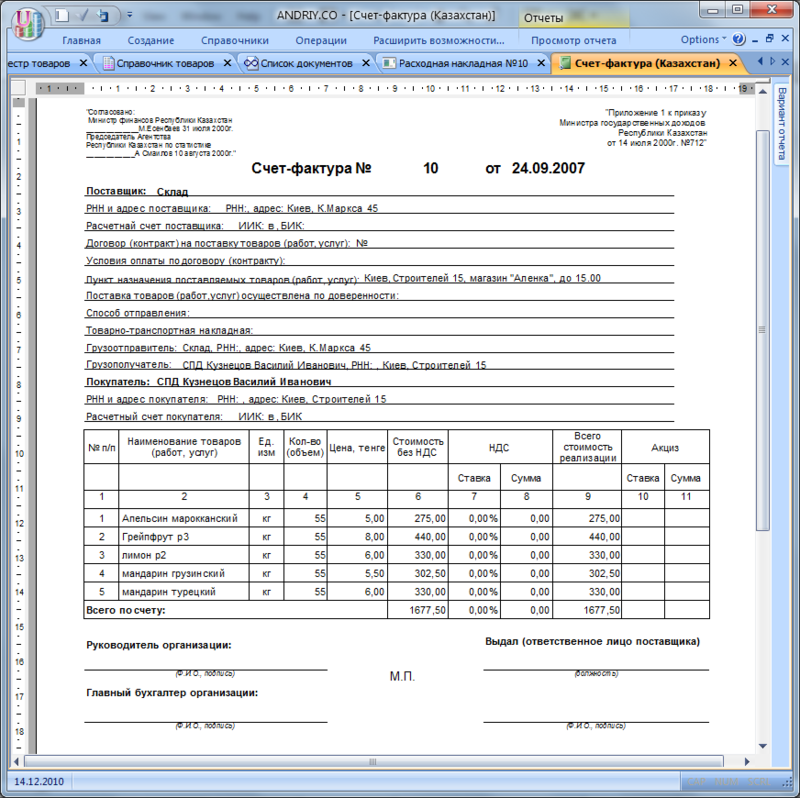 Reports are saved in XML format and can be connected to master records for future use. Later designer will develop. 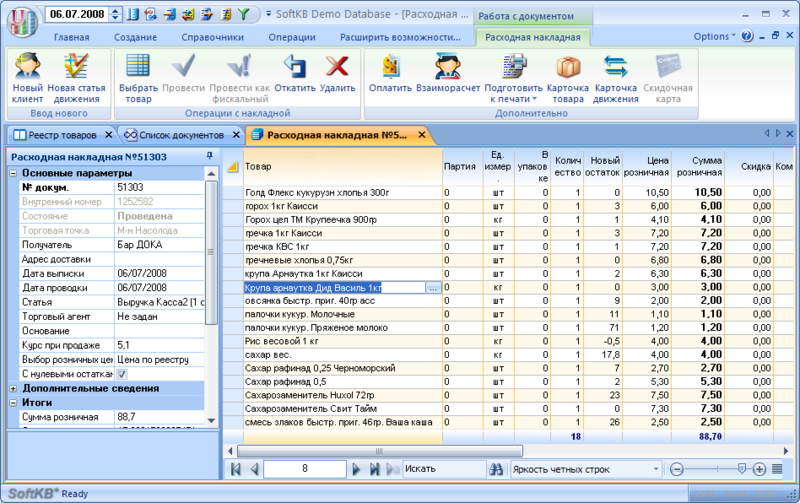 Inter alia, it is planned to implement the built-in editor SQL - queries. 3. In the act of a re-implemented the possibility to overestimate the entire product to a whole percentage. To do this, highlight the desired items in the act of revaluation, by clicking on the record before the selector name (blue box) and hold the Shift or Control. After changing the percentage of premium (a positive value) or discount (negative percent). Prices for selected products will be changed to the specified percentage. To select all items, just click the triangle in the upper left corner of the table. Also drew attention to the switches of rounding. Asking the right value of rounding, you will get a rounded price in the column "price after". In the next release PRODUCTION!!! The users who bought the program, get updates for 1 year FREE !!! 1. The distribution rights of the users moved from editorial Evolution of the Network Editor. 2. Again, put warnings on inconsistencies in the register of retail prices of goods and the income or expenditure bill. 3. 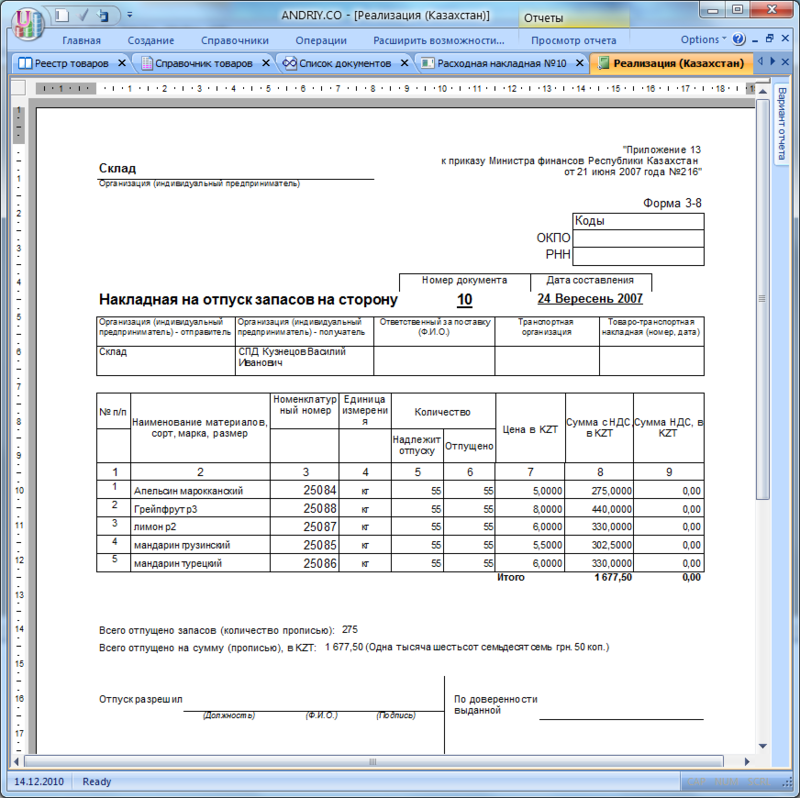 In Russia, you can download two new xml-Report - Invoice and Invoice. on this link download a small zip-archive . Unpack it in the program directory (usually c:\program files\tcu3) Run the program. 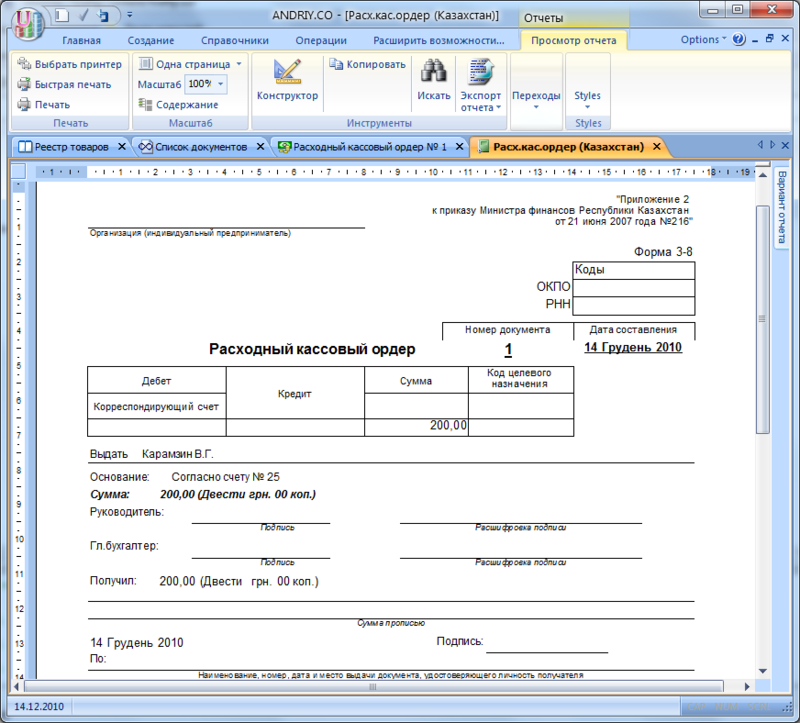 Now, in the consignment note when you click on the lower part of the button "Prepare to print, you can make out the invoice and tax invoice (invoices) in the Russian version (see. Picture). 1. Preparing a new handbook on F1. After that, the picture appears, the present at the screen. If you want to open the directory client, click the "K". Thus, for each item ribbona can create a sequence of keys. Over time, the operator remembers those two-, three-sequence, resulting in an effective and quick work. 3. Works Copy-Paste for product entries in the overhead. Note the desired record by clicking the Record Selector (for each record, the blue area in front of recording) and for the right mouse button click the "Copy." Then in another note Hit insert. 4. It supports multiple choice items when adding products in the master records. 5. Increased formation mechanism of price-list price percentage cords. Now you can build 5 of price-list price, not only lowering the first (maximum) price-list price, but also increase by a certain percentage of the purchase (to be a separate article). 1. Removed the option of automatic per cent premium to the purchase price for the formation of the retail price of receipt overhead. Now it is fully responsible for merchandise entry in the directory (to be a separate article). 2. Greatly increase the overhead wiring (notably in the large volumes of data). Improved appearance. Pay attention to the style of tables and poster design. Faster sample products in the documents (when much larger amounts of samples). Added statements to the stock option without specifying the quantities and prices (for wishes). After wiring the overhead of sorting. In the field of overhead added to the search for records. 1. In a re-bills and acts, when changing the size of the lateral panel, pull the input field product. Appeared disconnected column bar codes. Not very aesthetic spectacle. Corrected. 2. When Printing consumables bill, in which there were no goods and had only reusable container - the program an error occurred. Fixed. 1. Using the discounted cards (to be detailed paper). In short - in the directory of clients ask for a customer number discounted cards, ask the percentage of discount, put the box next to "active map" and click Apply. After that, in the expenditure invoice discounted scan the card and for each product in the invoice is automatically calculated discounts. 2. Now the main thing. At the beginning of another TCU2 the system was laid multilanguage interface. The time has come, TCU3 now supports native Ukrainian. All boys and girls with SoftKB were awfully fun. To enable Ukrainian, go to "Reference" -> "Settings" -> "interface" and choose from the list of Ukrainian language. To the new settings took effect, the program to restart. May be some comments on the translation, always ready to listen and take note. With best wishes from SoftKB. Translated participated Andrei Kravchenko, Andrei Mukan, Natalia Rusavska. Fixed operation with flags. Of an editorial TTSU Start, Standard, and Evolution. 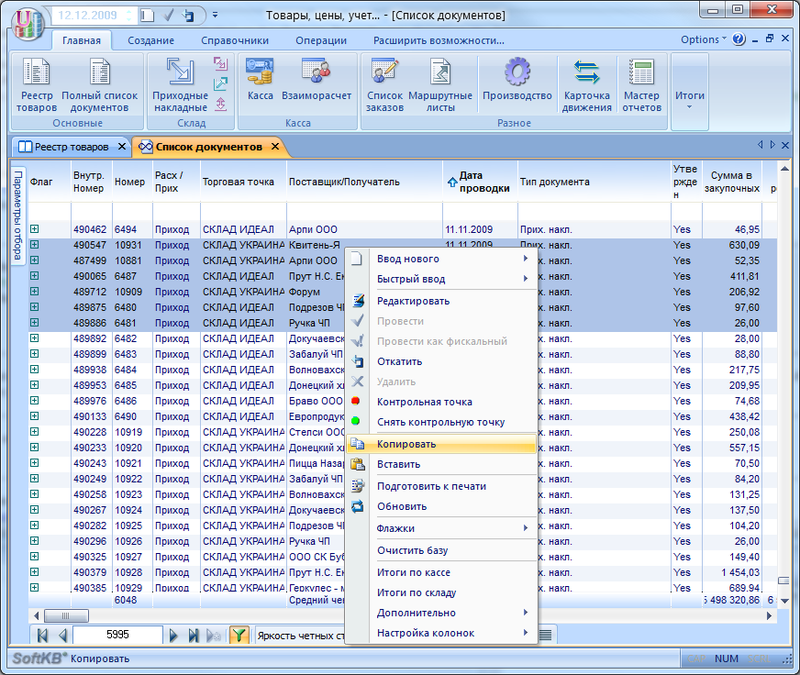 When perechityvanii list of documents from the database now remembers the current document, the allocation dropped prior to the first line of the list. Removed OPOS driver for the scanner as obsolete.